The leaves fell slowly around the small Raindorf plushie, covering it in a light layer of bright oranges and reds. Autumn had settled in Neopia with a warm welcome, bringing the bright colors of fall without the slight chill that normally swept through Meridell. The plushie shifted, seemingly of its own accord, and the bright blanket of leaves surrounding it drifted gently to the floor. A single sigh, deep and mournful, echoed from it, but much like a tree falling in a forest, there was no one to hear it. 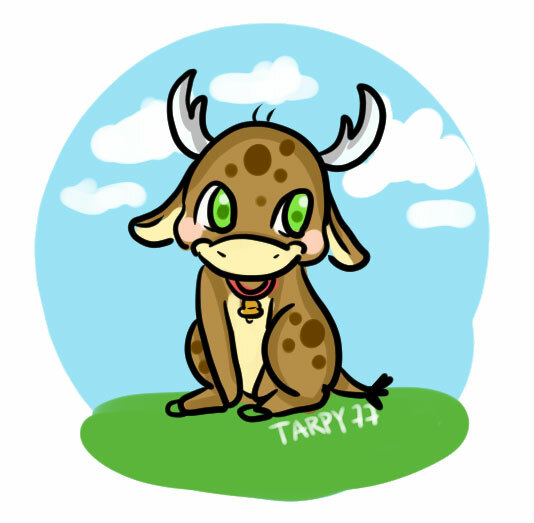 “If a Kau sighs in the forest, and no one is there to hear it, does it make a sound?” The plushie murmured quietly. As it spoke, the plushie did not move, and it was only after another sign was heaved that it would have become obvious to someone watching the scene that is was not the plushie that spoke, but an invisible presence behind it. The Kau, a friendly fellow by the name of Tarpy, shook his head and lifted himself off the ground, away from the tree he had been leaning on. He carefully brushed a few leaves off of himself, and picked up his Raindorf plushie, preparing to head into town to find food. 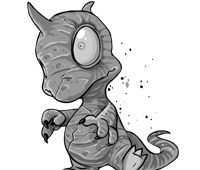 A long time ago, Tarpy had been a neopet much like any other. He had lived in Brightvale, where he studied magic with the likes of Cyra the Cybunny (who owned Brightvale Potionery), and had been on his way to being a great warrior of magic and hand-to-hand combat when a spell had backfired and turned him invisible. Unable to reverse the spell, he had been forced to live a half-life, stealing food and sleeping in the forest, terrifying poor neopets who bumped into an invisible mass or heard a voice coming from thin air. All Tarpy had left of his old life was a small plushie he had been given as a child, which he had brought with him when he had left for the woods. But before he had become resigned to a life of solitude, Tarpy had tried his hardest to find a way to regain his normal life after he lost it, and learned many a difficult lesson on the way. Tarpy listened to the young cloud Pteri with a bemused expression, having known the small neopet for most of her life. “That’s excellent, Nima. Very good work. I’m sure with enough time you’ll be big and strong as me!” He patted her on the head, and resumed eating, chuckling into his soup. There was nothing more adorable then new trainees. Tarpy himself was far from that point in his training. He was older, faster, and had a greater endurance than most of his peers, and his skills had been honed to a art form. Nevertheless, he always made time to eat with younger trainees, and he enjoyed helping to build up newcomers in the community to give them confidence in their newly-found skills. “Perfect!” Nima squeaked, before fluttering off to get her own food. Tarpy finished his meal, and left the dining hall to get back to his training. It was a bright summer afternoon, and the sun beat down on his brow as he made his way back to the library where he had been studying magical tomes. He settled down in a worn armchair, opening a tome he had read before, with instructions to create Altador Strength Potions, as well as fighting techniques that focused on utilizing strength and speed in combat. After several hours of studying, Tarpy closed the tome and prepared to head to his home, where he had a cauldron ready with all the ingredients needed to create the Strength potion. On the way out he ran into a gaggle of young trainees huddled in a corner, whispering amongst themselves. He couldn’t help but overhear their conversations as he passed, and after he heard “Nima!”, he walked closer to listen more carefully. Tarpy frowned mightily, rubbing his chin. Why were some people so vicious, he wondered, that you could dislike someone as harmless as Nima? He decided then and there to speak up, and turned to the group. With a nod, he left the walkway, heading back home. There was not a hint of hesitation in his mind- he would brew an excellent Strength potion, become as strong as possible, and then he would brew a dozen more for Nima, so that she could stand up to those bullies. With this goal in mind, Tarpy began his preparations, knowing it should only take him until dinnertime to finish the first potion, in time for him to test it before his sparring match with Nima. He had faith in the tiny Pteri, and knew she had the wits and the speed to best someone of any size with a bit more training- and he would help her get that training. The brewed concoction smelled faintly of berries, and he ladled it into a potion bottle, checking the color against a reference in the book. He couldn’t wait to be stronger, and show Nima that she could be strong easily as well. He took an experimental taste, relieved when it tasted just as it had smelled. He triple-checked the dosage, and drank down all that he was supposed to. The taste of berries…was overpowering. He choked for a moment, eyes watering, and shook his head. It would be fine. He waited for a few seconds, and began to feel a tingling in his feet. The sensation travelled the full length of his body to his ears, and with a pop, disappeared. He stretched, feeling refreshed, and then walked over to the corner of his house where he kept his weights and training materials. He lifted a weight tentatively, frowning when it seemed much the same as before. He brought it back with him into the kitchen, and read through the instructions once more, trying to decide if he needed to drink more to feel the effects. “One standard 750ml potion bottle is one dose.” He read carefully, “Drinking more than one dose is not advised. A person needs only be so strong.” Tarpy frowned. It’s not for me, he reminded himself, I’m trying this for Nima. He closed his eyes, considering. It couldn’t hurt to drink a second dose. Otherwise they would have put a stricter warning. He thought for a moment, and opened them after a moment, determined. He measured and poured another serving, and gulped it down. The tingles were more violent this time, and when they disappeared he felt a significant difference. Grinning, he bottled two servings and set out to share his newfound strength with Nima on the sparring grounds. When he arrived, Nima was practicing their form in a corner of the field, where many other trainees were gathered, talking and training amongst themselves. Tarpy strode over, potions in hand, and went to tap Nima on the shoulder, when his hand passed through her arm. Tarpy yelled, examining his hand. It looked completely normal, but as he looked up to ask Nima what was going on, he realized no one had moved. It was as if he had not made a sound. There was no reaction from the small Pteri, and Tarpy’s eyes widened. “Can anyone hear me?” He roared, panicking. “Am I dreaming? Why can’t anyone hear me?” In his shock, he dropped the potions, shattering them on the cold cobblestone of the sparring arena. Nima jumped, staring at the broken potion bottles. “Whoa, who dropped that?” She questioned shrilly, looking around in confusion. Tarpy stared back at her, waving his hooves in front of her face. “It’s me, Nima! It’s me!” But there was no response. Tarpy’s mind raced, as he tried to figure out what was happening. “The potion,” he gasped, realization dawning on his face. “There’s something wrong with the potion.” He raced back to his home, passing his peers and young trainers alike. In his hurry, he almost hit someone walking down the street, but to his horror, he merely passed through them, as though he were a ghost. He arrived at home, panicking, and raced towards the tome. He read through the description of the potion a hundred times, but to no avail. Finally, in frustration he threw the tome to the ground, and the pages fluttered to the back of the book. A warning, a single paragraph of text read, one who uses these potions runs the risk of getting exactly what they ask for- a potion of intelligence may make you unable to speak in anything but intricate riddles if you are tempted to drink too much. A potion of speed may make it impossible for you to sit still. A potion of strength may make you too powerful to live in the world of mortals. Your struggles, your goals, and your hard work all will be for naught. For there is no substitute for passion and time, and these potions will grant you neither. If you consume too much of a potion, you must work long and hard to gain the skills you sought from a bottle. Study, train, and gain your skill rightfully, and you shall regain what you paid. And here he stood, stronger than he could have ever imagined, and still unable to communicate with a single living soul. Tarpy sighed, pressing a hoof to the old, knarled tree he had made his home, and turned back to the town once more. There was work to be done, and someday he would be strong enough to escape this curse. With another sigh, he and his Raindorf walked into the town, preparing to walk again unseen amongst those who had once been his peers. Tarpy groaned. He had a lot of work to do.